Just east of the Ural mountains, we made our next stop in Yekaterinburg, Russian's fourth largest city. 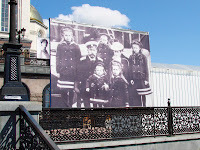 It is best known as the site of the exile and execution of Tsar Nicholas II and his family by the Bolsheviks in 1918. Of all the stories we heard on the trip, to me the story of the Romanovs was the most fascinating. While we had too much time in Kazan, we didn’t have enough in Yekaterinburg. We were there for just 4 hours in all. Our first stop was the Cathedral of the Blood, which is built on the site where the Tsar and his family were executed. They have somewhat recently been sainted by the Russian Orthodox church as martyrs, and the whole church had just been celebrating the 90th anniversary of their execution. There were large posters of the family surrounding the church, like the photo above. Many of the icons in the church were also images of Nicholas II and his family. This was the newest cathedral that we visited and in contrast to the others was clean and bright inside. It was painted blue and white throughout, more like the Kazan mosque than the typical deep reds and golds of other cathedrals. Women had to wear not only scarves but also skirts to enter. So, those of us in pants were given a wrap to put around our waists. And like all of the cathedrals we visited, there was a small souvenir shop at the exit. After the Cathedral, we struggled through traffic to get to the border of Europe and Asia, which is just outside of Yekaterinburg. When we got there, a Russian military guard boarded the bus and demanded to see our passports (which we had been told to leave on the train at all times). He then told us that we would be punished, and had to exit the bus and walk to the border where we would have to endure a celebration of champagne and chocolates! It was pretty cool to stand with one foot in Europe and one in Asia. Yekaterinburg seemed a more modern city than Kazan, and also a bit of a "boom town," with tons of traffic and construction everywhere. It seemed maybe 5-10 years ahead of Kazan in terms of its modernization. Like the other cities, the tour took us past a lot of universities and statues, though here there was a much greater emphasis on war heroes. We heard a lot about the "Black Tulip" memorial to the soldiers who died in Afghanistan. It reminded me of a similar memorial that Luda and Anton took us to in Zaporozhye, which seemed to hold great importance to them as well. Then it was back on the train, where we soon also crossed the border into Siberia. That night, we were entertained by Natalia Orlova, a lovely singer and guitarist from St. Petersburg who traveled with us for about half of the trip and gave several concerts along the way.